The Spine of Merthyr Chiropractic Clinic is a well established practice ideally situated near the centre of Merthyr Tydfil and has provided the best possible healthcare since 2006 to local people of Merthyr Tydfil and the surrounding areas including Aberdare, Bargoed, Caerphilly, Blackwood, Rhymney Valley and further. There are ample car parking facilities close by and the opening hours of 9am to 6pm from Mondays to Fridays are suitable for even the busiest patient. Emergency treatment is available on Saturdays and out of hours. The clinic is recognised by leading Health Insurers including AVIVA and WHA. Please enquire with the clinic. General aches and pains, and conditions that are due to problems with the joints, ligaments, tendons and nerves of the body, particularly those of the spine. Treatment, where appropriate can include spinal manipulative therapy, mobilisation, soft tissue work, therapeutic ultrasound, interferential therapy and the use of other adjunctive techniques. Ergonomic, postural and nutritional advice also included. Should you have a complaint that is not listed above, please do not hesitate to contact us for further information. The initial consultation can take up to one hour and consists of detailed case history taking and performing a full examination. Treatment is included and is £47.00. Further follow up treatments can take from twenty minutes up to a half an hour and is £27.00. Both cheque and cash accepted. We also offer Dry Needling (Western Acupuncture ) and Sharon is registered with the Merthyr Tydfil County Borough Council. Chiropractic is the third largest primary health care profession after medicine and dentistry in the Western word. Health insurers and the medical profession all recognise the positive contribution of chiropractic to healthcare. Chiropractic is a health care practice specialised in the treatment of musculoskeletal conditions, or any problems related to muscles, joints, tendons, ligaments or nerves. A common misconception about chiropractic is that it is only used for treating back and neck pain. Although these are common complaints in a chiropractic workplace, the principle can be applied to all the joints of the body from head to toe. Chiropractic is an approach to health care which utilises the body’s natural recuperative powers. Chiropractic treatment mainly, aims to free joints of the spine or other areas of the body that are not moving properly and to improve the efficiency of the nervous system therefore releasing the body’s natural healing ability . It is the science of locating and correcting by hand. Most often, this requires a high velocity low amplitude thrust to a join, utilising safe, specific skilled adjustments, and can bring immediate relief of pain and other symptoms. Therefore results in positive health benefits. Keeping spinal function at it’s optimum helps to speed up the natural healing process of the body. Chiropractic in the UK is a Government registered profession; therefore all chiropractors practising in the UK must undertake four years of training at a recognised university in order to be eligible for registration with the General Chiropractic Council (GCC). In order to maintain annual registration chiropractors must continually update their skills through methods of continuing professional development (CPD). 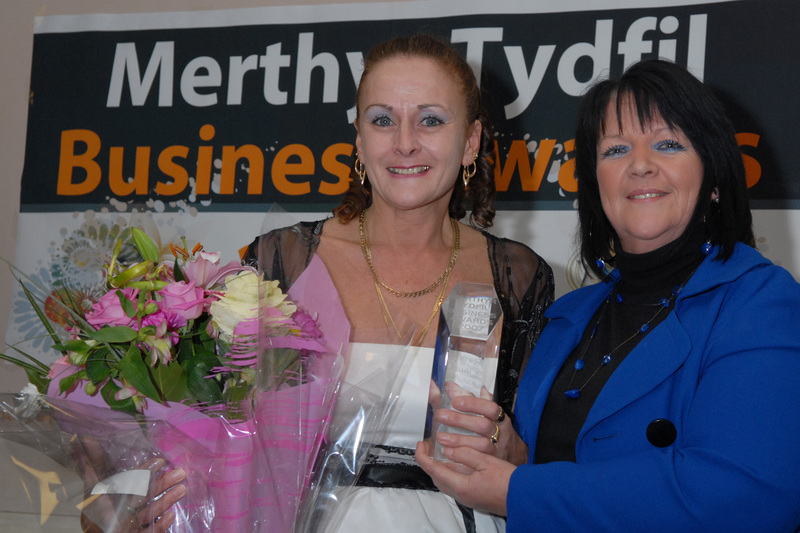 Sharon Brewer (left in picture) receives a Lifetime Achievement Award from Ruth O’Donoghue of ‘Working Links’ at the Merthyr Tydfil Enterprise Week in 2007. The week of activities formed part of a 12-month action plan by Merthyr Tydfil County Borough Council and its partners to encourage entrepreneurship within the Heads of the Valleys. Sharon also received two awards at her graduation from the University of Glamorgan in 2006 which included Personal and Professional Development. Sharon Brewer, Doctor of Chiropractic, BSc (Hons) Chiropractic, PGCC, qualified from the Welsh Institute of Chiropractic in July 2006. She is a member of the British Chiropractic Association and is registered with the General Chiropractic Council. Sharon is the first chiropractic student to qualify from Merthyr Tydfil and is still local to the area. She is also a recognised member of the community. Sharon took great pride in supporting chiropractic and nursing students within the Dyslexia and Disability Services department, and also had a role of Clinical Supervising Lecturer at the Welsh Institute of Chiropractic, both of which are situated in the University of South Wales. Sharon is currently supporting Chiropractic students with Beacon Support.